Vintage ceramic soap dish of the cutest whale ever.. 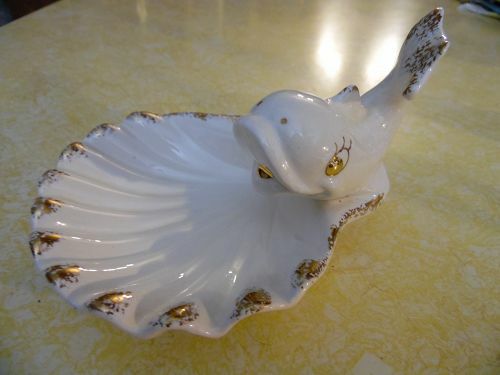 He sits on the dish which is a shell all white with gold detailing. No chips or damages. Measures 4" to the tip of his tail. Shell is about 5 1/2" diameter in both directions. 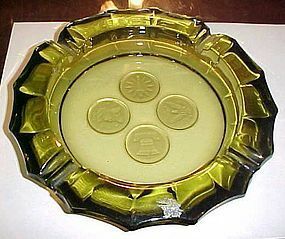 This could easily be considered an ashtray too or candy dish. No sticker or makers name. A great addition to any ocean theme collection. 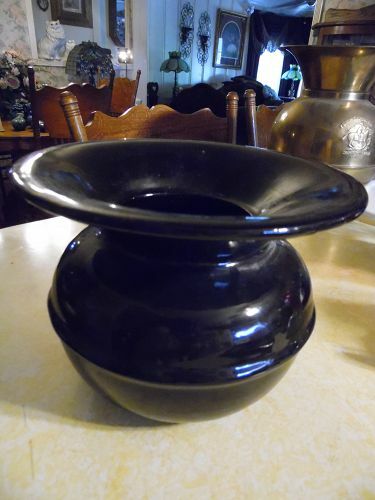 1940-1957 glazed pottery spittoon, dark brown/black. Approx 6" tall by 8" diameter, marked Maddux of California with a number (which I can't make out). Perfect condition. 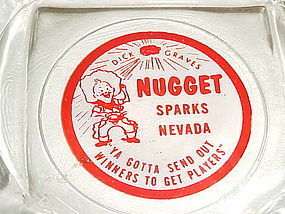 A great advertising ashtray from Northern California. Three corners with aqua and brown logo. Measures 3 3/8" at widest points. NO chips or cracks. There is some faint scratching on the logo when held up to a light. Mid Century Vohann Art Pottery California Hoodwink Collection Orange with dark crackle 3.5". Unique shape with center post and cuts on either side. Color is a nice orange with dark deliberate crackle all over. Very good estate condition with no damages. Fab mid-century collectible! The Vohann of California company opened in the 1950’s, in Southern California and became famous for their unique pottery. 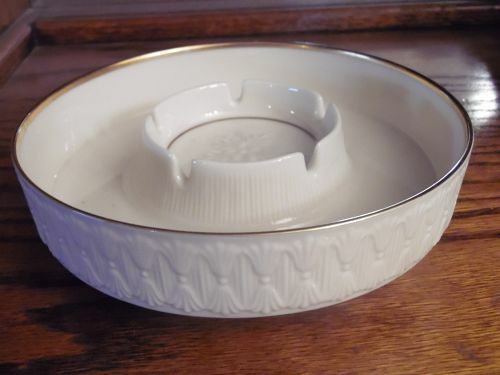 Vintage ceramic ashtray from the 1960's. Hand written in gold BWGT 1966 (Bob Weinberg Golf Tournament). Golf cartoon center with gold edge trim. 3 cigarette rests. No damages or wear. Measures 5 5/8" in diameter. 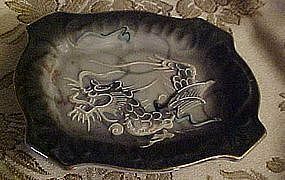 Nice dragonware ashtray is originally from a set. So if you are missing a piece, here it is! The gold gilding in contrast with the black paint is amazing. 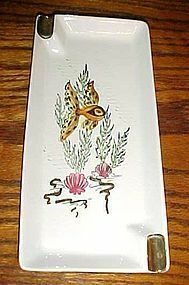 This is a very old and beautiful example of moriage dragonware. The gold gilding compliments the blue eyes and other pastel colors. BP Japan paper sticker on the bottom May have the red Japan stamp under the sticker like my other pieces had. 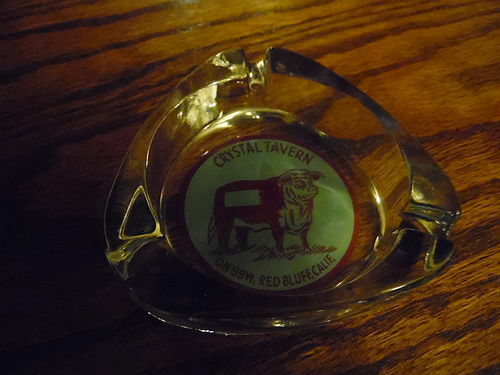 The ashtray is 3.5 x 2.5 in. NO damages!! 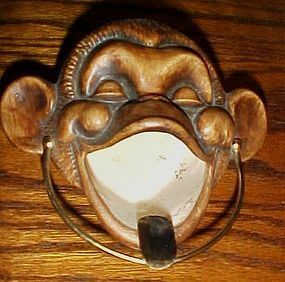 Ceramic Tiki Monkey Ashtray Vintage by Treasure Craft 1960 Compton California monkey or chimpanzee ashtray. 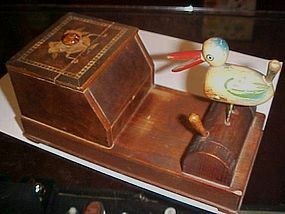 Rare- In Used Condition - no chips - minor tarnish on brass cigarette holder, and a few crazing cracks inside the ashtray area. Marked on bottom with Treasure Craft Mark 2 3/4" High - 5" Wide - 5" Across There is no staining, I have cleaned the inside since this photo was taken. 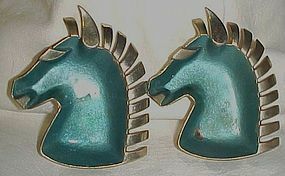 Pair of vintage mid century stylized horse head ashtrays. Chrome with blue enamel bowl. Back has a brushed gold tone plating. 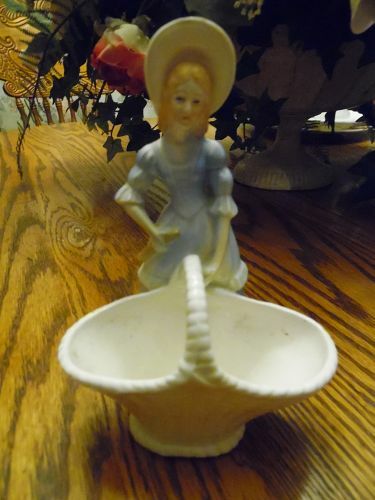 Measures 4" tall and is 3 1/2" wide. 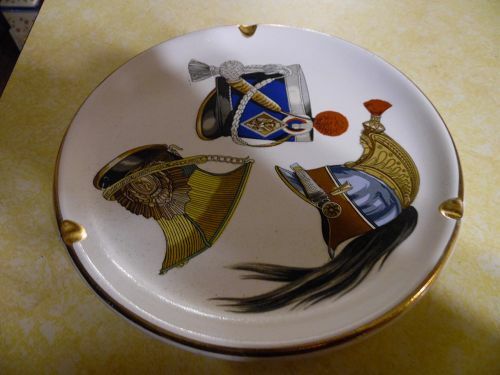 One has a few worn areas to the blue enamel plate. 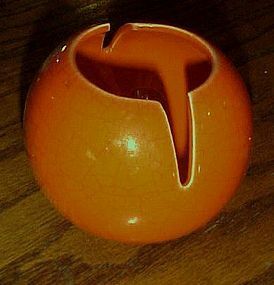 I could not find these in any of my 4 books on ashtrays, or on the internet anywhere. Must be unusual ones. Selling as a pair. No markings on the back. 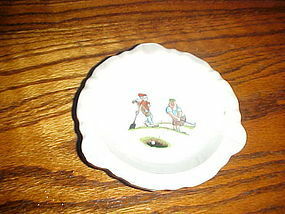 Collectible ashtray by Lefton Exclusives. Has a coral reef, under ocean scene of a fish, seaweed and shells. Measures 4 1/4" x 9 1/4" and is in perfect condition, with no chips, cracks or discoloration. Original label # 575N. Shiny bright gold painted highlights and cigarette rests. 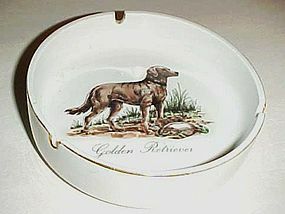 wonderful porcelain ashtray with gold trim and an image of a Golden Retriever dog. If you love Labs this is very nice for you. Measures 5 5/8" diameter and is 1 1/2" deep. Excellent condition with no chips, cracks or wear. Vintage wood box made in Switzerland, Measures 6 1/4 x 4 7/8, and is 1 7/8" tall at the top of the curved lid.IT may be a cigar box, the wood has a nice smell. 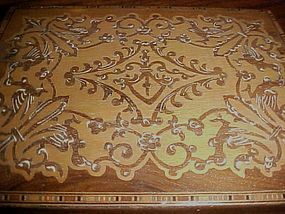 Intricate inlay pattern. There is a small hole in the bottom, and a few slight veneer chips on the corners. Some gentle surface wear shows because of the age. Box lid has original hinges and fits snug and would be airtight except for that small hole I mentioned. 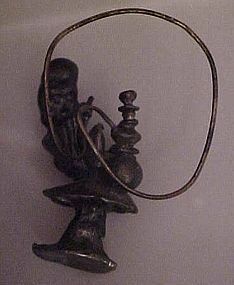 Unique and different solid pewter 2 1/2" tall figurine of what appears to be a genie smoking a hookah while sitting on a mushroom. It appears he's been hitting it hard, as his turban is flopping, an he's hanging on to his toes to keep upright. (lol). He is wearing a robe and shoes with the curled toes. Scratched in the bottom is the date 1988. A neat conversation piece to say the least.